Put another way, should books be part of your training solution? Books have been around in various forms for thousands of years. We first had stone tablets and papyrus scrolls, parchment, wax, then finally paper. The invention of the printing allowed for large scale production, and cemented ink and paper as humankind’s go-to method for recording history and passing on knowledge. But, alas, over 5,000 years later, the monopoly books have held on the learning industry is no longer. What happened? Well, not only did “Video kill the Radio Star,” but video seems to have killed the literary world as well. I hear regularly that “today’s learners prefer videos” and that today’s learners require short videos because of their lessened attention spans. I’ve also grown accustomed to hearing that books are for baby boomers while millennials prefer videos. But is that really true? According to recent research by Skillsoft, books are not a “has been” of the learning industry but rather an important and desired part of the training mix. Skillsoft recently undertook an extensive research project aimed at determining the relevance of books in learning in today’s digital age. The survey reached out to 2,000 learners across a range of generations and asked questions about preferred learning types—videos, courses, traditional classroom learning, books and more. The survey was then followed up by in-depth interviews to get a better understanding of the survey results. One of the first findings gleaned from the research was that, as popularly believed, video is a favored way to learn today—but it is far from a runaway leader. Looking at the above chart we see that books were identified as important in the learning experience by all respondents, regardless of generation. The research also found that the type of studying respondents are doing influences their desired learning materials. For example, in instances where outcomes matter—such as studying for an industry certification or trying to ace an exam—books are a preferred way to learn. Much like the music and movie industry, the publishing industry has worked to modernize books to take advantage of digital technologies. Although some people still prefer a tangible printed copy, paper books are increasingly being replaced by digital copies, and some publishers, like the popular O’Reilly technology books, no longer publish in printed format. From tablets to papyrus scrolls, parchment, wax and paper—and still, “the book” evolves. Today’s idea of what a book is and what it could become changes rapidly. Digital books have taken on exciting new formats, incorporating audio and video to the traditional printed word. 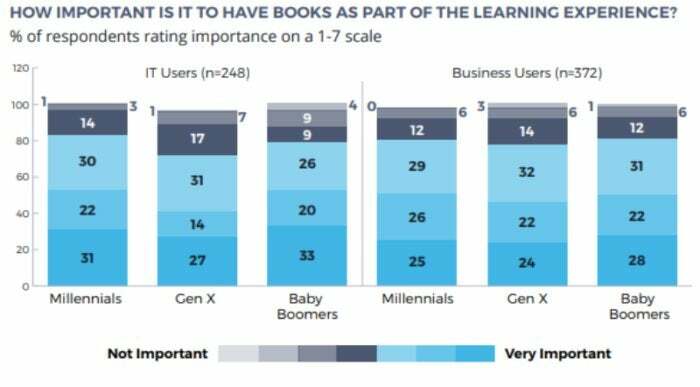 And publishers continue to redefine what constitutes a “book” as technologies like machine learning and AI transform how people take advantage of online learning resources. 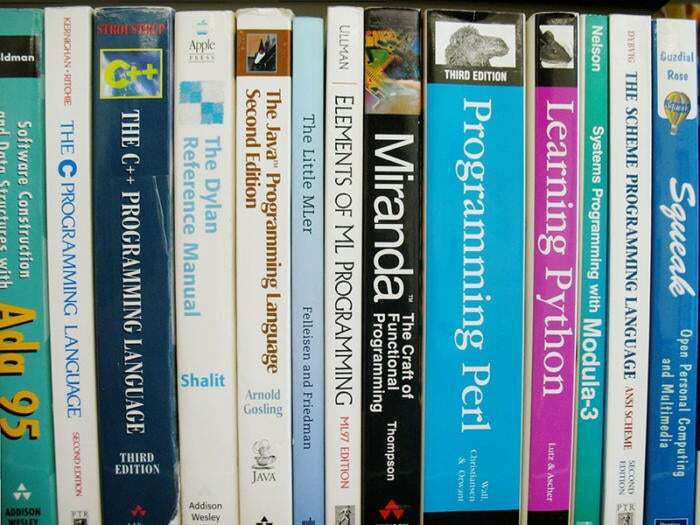 What are the best ways to incorporate books for your IT Team? If books are not a part of your IT training mix today, you’re omitting a powerful and desirable source of learning for your teams. While I don’t advocate allowing your team to purchase books from Amazon and expense them—a costly approach that’s also not scalable, consider investing in access to collection of digital books to add to your learning mix. Libraries of digital books like Skillsoft Books or Safari Books Online are great options. A good IT digital library will provide instant access to tens of thousands of dollars’ worth of books to your entire team for tens or hundreds of dollars per staff member per year. Plus, a digital library will make it easy for your staff to search specific key words or phrases and isolate the exact content they’re after. There are two major players in the digital book library space for IT and developer professionals, Skillsoft Books and Safari Books Online. Both offer extensive libraries with both broad and deep content coverage. Your organization’s specific learning objective may render one vendor more favorable than the other, but in general the coverage is comparable. Some people may have preferences for specific publishers, but today you can find in-depth topical coverage across a range of publishers to meet your needs. In addition to depth and breadth of content offering, another key consideration is ease of integration with your existing learning mix. I have seen organizations that require their staff to search one system for courses, another for videos, and another for books. Suffice to say this is not conducive to a productive learning experience. Ideally you should be able to offer a single “federated” search that gives the learner all the relevant learning assets regardless of modality. Another popular feature with online books for IT is the ability to read the books “offline.” This allows learners to take their materials anywhere, regardless of internet access and enables learners to make use of otherwise unproductive time, like commuting or traveling. Learners can download sections or entire books to their mobile device and take them anywhere without relying on Wi-Fi. Not old fashion or out-of-date, books are a reliable and in-demand learning modality that is too often forgotten in the fast-paced digital age. Include a digital library collection as part of your training and learning mix for the most comprehensive training offerings. Jim Zimmermann is the Senior Manager for Skillsoft's Solution Practice and the practicing Solution Principal for IT and Digital training solutions for North American and EMEA. He and his team work with many of the largest organizations in the world to help them optimize their training.